Monoski can be used by people with disabilities in their lower limbs. With its light, innovative architecture, it is designed to guarantee high performance. The objective: the Vancouver 2010 Winter Paralympics. The monoski designed by Pininfarina is a highly advanced piece of sports equipment with absolutely innovative design and manufacturing features. The multipurpose wheelchair is transformed in a few easy movements to adapt to every need, and then fold up to fit into a backpack. With just a few movements and simple accessories it allows a disabled person to do sports and to travel over any type of terrain. Smily is a revolutionary simulation unit for Faculties of Dentistry, produced by Saratoga, designed by Pininfarina and developed with the backing of a committee made up of eminent professors from the Italian College of Dentistry Teachers. Its shape and dimensions were created to be accessible even to students in wheelchairs, paying particular attention to the aesthetic, functional and ergonomic innovations. An innovative modular system for the office: at the centre of the work station is a technological “tree” with built-in lights and, all around it, desks, worktops and drawer units arranged to encourage both individual creative work and team work. The system was studied to respect the minimum distance of 50 cm between the operator and the computer monitor. C.H.I. (Computer Hand-Free Interface) is a helmet based on electro-optical technology that makes it possible to emulate all the classic functions of the mouse perfectly. The cursor follows the user’s head movements, which means that the computer can be used by someone who is unable to use his hands: this is made possible by an emitter of modulated infrared rays positioned above the monitor and a sensor solid with the user’s head. 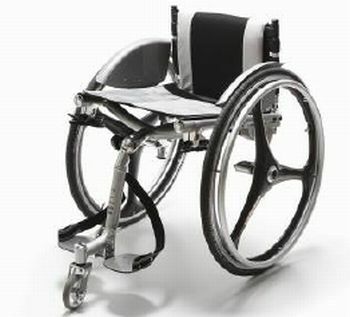 Design enters the electric wheelchair market with aesthetical and functional innovations. The chair designed by Pininfarina Extra for the Chinese company Shanghai Forever Co. is the first of its kind and has iconic styling that departs from the hospital image, transmitting lightness, simplicity and elegance in its harmonious, compact proportions and in the colour range. An electronic polling booth for remote voting. Access to vote is guaranteed by an easy-to-use, ergonomic system. People with physical or sight disabilities can vote without outside help. Pininfarina Extra has collaborated with the European research and development and marketing validation programme for electronic voting known as E-Poll. To mark Torino 2008 World Design Capital, Pininfarina Extra, in collaboration with Polytechnic of Torino, the IED, the AbleToEnjoy company and CEAN, is exhibiting innovative solutions that combine design and practicality, allowing environments and products to be enjoyed by a wide public with different perceptive, motor and cognitive abilities. The exhibition, DesignAbility, is open to the public today and tomorrow (Saturday and Sunday, November 15 and 16, from 9am to 6pm). DesignAbility has been created to underline the importance of design in every area of our life. A journey to discover the most innovative elements of contemporary design that can overcome the conflict between man and environment in every context: work, sport, mobility, study and research. The projects elaborated by Pininfarina Extra and its partners reveal design that is accessible to everyone, made up of objects, equipment and environments that can be exploited autonomously by users with diversified needs and abilities, including people who have functional limits because of their age or because of malformations, medical conditions or traumas: from the monoski designed in preparation for the Vancouver 2010 Paralympic Games, to the first electrical wheelchair designed by Pininfarina, an electronic device for the PC that makes a mouse unnecessary, and a modular office system. The innovative DesignAbility exhibition layout was studied by DISET, the Department of Building and Territorial Systems Engineering of Turin Polytechnic. In line with the multisensory issues addressed, the space and areas of the exhibition were organised taking as a “leitmotif” the abilities of the general public: the elderly and children, and people with sight, motor and sensory impairments. The visitor is guided towards the Pinin Room, helped by a rubber and PVC path designed by the Mondo company to make things easier for the blind and partially sighted, where an itinerary made up of 8 exhibition areas addresses the issue of design that is accessible to everyone: objects, equipment and environments that can be exploited autonomously by users with a wide range of needs and abilities. A tactile map of the exhibition is also provided for the visually challenged, and in some cases (like the Torino 2006 Olympic Torch), it is also possible to touch the object on display. There are two areas dedicated expressly to the young: the first contains projects by students in the 2nd year of the course in Industrial Design at the IED of Turin, who have worked with Pininfarina on the issue of “Design for all” applied to an urban situation. The second area contains the work of the 3 finalists of the Shop Ability International competition for young designers. Thanks to the E-Poll (an electronic polling booth for remote voting) every visitor will be able to submit a vote to select the “popular” winner of the Shop Ability International competition. On the occasion of the exhibition it is presented the book “DESIGNABILITY”, realised by Pininfarina Extra in cooperation with the Polytechnic of Torino and Tactile Vision onlus. The idea behind this book is that it should be read, seen and touched. It is a tactile book which tries to involve and inform as many people as possible. Drawings, pictures, texts, colours and paging seek to provide understandable notions at different levels and for all kind of readers. To imagine a book is like doing a new project, consisting of graphics, of texts and drawings but of thoughts, dreams and hopes as well: the main goal is to fulfil the needs of the reader. The most important idea was to create a book able to satisfy every degree of reading ability, in the spirit of the exhibition. That is why this book has a first part which contains information on several levels. The text in Braille is overlaid on the traditional text screen printed in ink; the use of this type of ink in relief escapes the notice of the inattentive observer, but contains information that is priceless for fingers that are able to run down the pages. The text is closely related to the representation of exhibition objects: on the one hand the drawing – plane and relief – which follows the dictates of orthogonal projections to represent the idea comprehensibly for the person who has to construct a mental image. Alongside, the photo of the object. The most detailed explanations are contained in the second part of the book. The graphic layout and the font selected – Garamond 16 pt – were chosen because the most recent studies show this is easier to read by those with blurred vision. Colours, contrast levels, simple and repeated graphic layout help to reinforce comprehension, the idea that underlies the whole project. In the book you will also find a “maquette”, a tactile map of the exhibition to help people move round it. The meaning of DesignAbility includes this idea too: to be able to design a pleasant-looking book that is also understandable to every kind of eye. 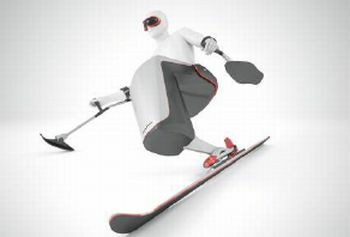 A new type of monoski that can also be used by people with disabilities in their lower limbs. With its light, innovative architecture, it is designed to guarantee high performance. The objective: the Vancouver 2010 Winter Paralympics. The monoski designed by Pininfarina is a highly advanced piece of sports equipment with absolutely innovative design and manufacturing features. The style departs from classic convention, underlining an important evolution for the choice of proportions and in particular for its unusual height. The line, which is a particularly effective synthesis of elegance, fluidity and dynamism, expresses modernity and sportiness. Lightness, comfort, aerodynamic efficiency, a view of the slope and easy handling are among the wide range of benefits enjoyed by a user with a functional disability in the lower part of his spinal cord and lower limbs. The technological solution has been patented and regards both the support structure and the attachment mechanism to a conventional ski with conventional bindings. The invention stands out for the following specific characteristics: rigid link structure between the seat and the lower part, which allows the chair to hook onto the chairlift without the user’s intervention; horizontal suspension kinematics that keep the size of the suspension to a minimum; motion return system which allows the shock absorber to be positioned horizontally, parallel to the suspension struts; new component styling that satisfies the demand for aerodynamics, ergonomics, user friendliness, and easy handling. To make up for the limited ability for control by the upper part of the body, the ends of the ski sticks are blades shaped like skis, which the disabled athlete uses to adjust his balance. What is more, a pelvic containment seat and a bag connected to the seat support and protect the lower limbs. A multipurpose wheelchair which is transformed in a few easy movements to adapt to every need, and then fold up to fit into a backpack. With just a few movements and simple accessories it allows a disabled person to do sports and to travel over any type of terrain. The project was the brainchild of a young designer and businessman, himself in a wheelchair, who re-interpreted the needs of the disabled person, thanks to his own personal and professional experience. B-Free is the name of the chair, and it was conceived to give maximum autonomy: by the simple replacement of a few components, it can tackle the most diverse terrain and situations, everyday life, the beach, the snow, off-road and sport. Fitted with a minute super-light folding aluminium chassis, the chair is fast, manoeuvrable and safe, with a linear design, accessories such as pedals and side panels in plastic and carbon, and fabrics in numerous different colours. By applying spacers, a front fork and small antioverturning wheel, the chair can be used for all types of sport, from tennis to basketball. With a single small pressure-adjustable front wheel and two dual rear wheels, the chair can move independently even on the beach. The same model can also negotiate difficult itineraries on the snow. The off-road outfit makes it possible to negotiate mixed itineraries (paving, gravel, dirt roads), thanks to a fork with a pressure-adjustable front wheel and dowelled rear wheels. Smily is a revolutionary simulation unit for Faculties of Dentistry, produced by Saratoga, designed by Pininfarina and developed with the backing of a committee made up of eminent professors from the Italian College of Dentistry Teachers. Its shape and dimensions were created to be accessible even to students in wheelchairs, paying particular attention to the aesthetic, functional and ergonomic innovations. The simulation unit was conceived to replicate the various working positions employed in daily practice, providing all the tools used by the dentist. The mannequin is positioned in a special compartment, and the working surface can be used as a desk. As well as being extremely modular, the unit also incorporates the latest technologies for audiovisual interaction. A specific electronic circuit makes it possible to send the film shot by the telecamera in the teacher’s unit to all students. The lecturer is able to monitor the students’ work if a videocamera is installed in each station. What is more, the students may attract the lecturer’s attention with a function incorporated in the control touch-screen and the lecturer can decide to convert the audio/video function from conference mode to one-to-one mode. 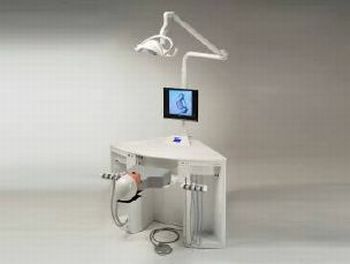 The Easy-Teach system can also be connected to an operating theatre some distance from the lecture hall. Smily’s particular shape also means that it can be used as an island or as counter-positioned units, making more space available inside the lecture hall. An innovative modular system for the office: at the centre of the work station is a technological “tree” with built-in lights and, all around it, desks, worktops and drawer units arranged to encourage both individual creative work and team work. The system was studied to respect the minimum distance of 50 cm between the operator and the computer monitor. The central tree hides the many cables, from both the floor and the ceiling. The project was created in 2004, when Pininfarina Extra moved to new premises in the headquarters in Cambiano (Torino). On that occasion, the Extra designers revolutionised the architecture of the premises on the basis of careful analysis of the designers’ needs and working methods. This led to the adoption of an original, patented, modular system based on a central island, around which the worker can move easily, with his tools or his wheelchair. 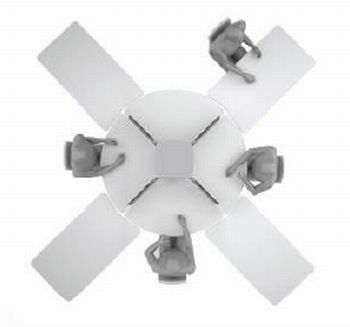 The choice of white as the dominant colour, of recessed lighting and aluminium finishing elements all help to make the working environment luminous and comfortable. It is called the C.H.I. (Computer Hand-Free Interface) and it is a helmet based on electro-optical technology that makes it possible to emulate all the classic functions of the mouse perfectly. The cursor follows the user’s head movements, which means that the computer can be used by someone who is unable to use his hands: this is made possible by an emitter of modulated infrared rays positioned above the monitor and a sensor solid with the user’s head. By measuring the angle of the incoming infrared rays, the sensor interprets the inclination of the user’s head and transmits this information to the computer through a standard serial port, which positions the cursor on the monitor. So it is possible to perform all the actions that Windows allows with a single click of the mouse, such as opening, closing and saving a file, copying, pasting, etc. The user performs the functions of the left mouse button by pressing a small rubber tube with his teeth, this, combined with a pressure sensor, activates the “click” and “double click” functions that are indispensable to operate the mouse. 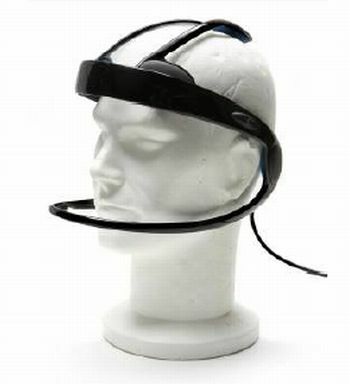 The development prototype, and the final product, incorporate a microphone which, together with voice recognition software, makes it possible to communicate commands and to dictate text, so that, thanks to the cursor control using his head, the user has complete control of the computer without using his hands. As it does with the mouse function, the computer interprets head movements like the control input from a joystick, thus making the helmet an ideal tool for games and entertainment. In a classic flight simulator, the head is used instead of the control stick that is normally emulated by the joystick to pilot the plane. To make the helmet light and also comfortable, so that it can be used for many hours without tiring the wearer, ergonomic studies were also undertaken to find the ideal points for it to rest on the skull. 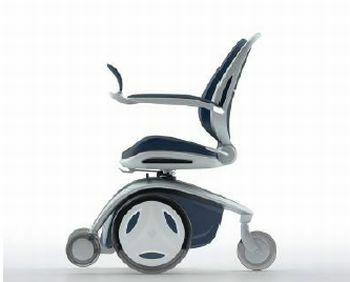 Design enters the electric wheelchair market with aesthetical and functional innovations. The chair designed by Pininfarina Extra for the Chinese company Shanghai Forever Co. is the first of its kind and has iconic styling that departs from the hospital image, transmitting lightness, simplicity and elegance in its harmonious, compact proportions and in the colour range. The Shanghai Forever chair blends dynamism and elegance, and boasts a number of innovations ranging from the anatomical seat, inspired by the racing car world to the use of light, recyclable materials, greater comfort and rationality in the operations and greater accessibility. The visible chassis in satin effect aluminium which terminates in a V on a single rear wheel is easier to manoeuvre and has more structural resistance. The chair is powered by two 300 W engines and two rechargeable 12V batteries, and is fitted with a seat belt, rear net bag, crutch support, metre/speed display, reflectors, GPS and emergency call button. The seat swivels and can be manoeuvred manually or electrically, and the platform folds. It is a new generation chair that not only helps the disabled to enjoy their daily life, but also offers them an accessible dream. 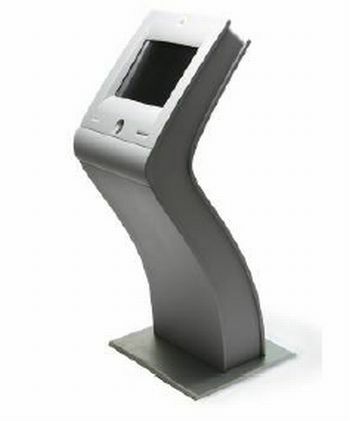 An electronic polling booth for remote voting. Access to vote is guaranteed by an easy-to-use, ergonomic system. People with physical or sight disabilities can vote without outside help. Pininfarina Extra has collaborated with the European research and development and marketing validation programme for electronic voting known as E-Poll (Electronic polling system for remote voting operations), which was launched with the goal of simplifying voting operations by integrating cutting-edge technology, the requirements of new European legislation and an organisational model that covers all stages of voting: preparation, identification and authentication (guaranteeing confidentiality by the use of a biometric smart card), expression (using a touch screen), authorisation, vote transmission (in a secure condition) and counting. In its capacity as an industrial designer, Pininfarina Extra has carried out the conceptual study, developing 6 booths during the research project and 85 in the second “market validation” stage, to meet precise goals of sturdiness and elegance, as well as easy access even for the disabled. The stylistic development also took into account the use of the booth for other purposes, for example educational and scholastic. The prototype booths were tested on various occasions, such as a referendum held in the city of Cremona on November 17, 2002, during the first experimentation, and for other referenda in the towns of Ladispoli (Rome) and Specchia (Lecce), when people voted simultaneously on the same referendum issue, for the first time in Europe, in four booths positioned in the town of Szigetszentmiklós in Hungary. The E-poll was funded 50% by the General Directorate for the Information and Media Society of the European Commission and 50% by the partnership created in Italy between the Ministry of the Interior and Siemens Informatica. The exhibition also has the great merit of giving space to and focusing attention on the creativeness of the designers of the future. Pininfarina has worked alongside the 2nd year students of the course in Industrial Design at IED Turin, looking for new concepts that could link disabilities and the urban reality. “In view of the importance of ‘Design for everyone’ in today’s society,” explained Cesar Mendoza, Principal of IED Turin, “it was a great pleasure for us to embark on this design adventure with Pininfarina Extra, a company that we respect and which we have worked with on numerous initiatives in the design field over the years.” ‘Design for all’ is a fundamental aspect of design, which a future designer must be familiar with, and be particularly sensitive to. Imagining and creating objects that can improve the existence and daily lives of people who are otherwise able is certainly an objective and a “duty” of every designer. “We are very proud,” Mendoza continued, “that today we can appreciate the results of our project, which are on show in the context of DesignAbility.” Standing out among the various projects developed by the students is “Urban Landscape”, by Alice Aquilante and Matteo Straforini: an interactive information point to find your way in large cities and to “surf” for information about the cultural events and entertainment the city has to offer. The urban installation is powered by a solar panel in the shape of a sail. It also incorporates light-sensitive devices that enable the sail to rotate around a central axis so that it is always aimed at the light, with the monitor in the shadow. The display was designed for everyone: a system of rails allows it to be positioned at the right height and turned in the appropriate direction. The LED lighting system makes the Infopoint visible even at night. The other projects selected are: “Tinity” by Kee Song Choi and Elisabetta Muner, “Take it easy” by Anita Peretti, Tomo Rimura and Giacomo Satti, “Parkwhere” by Umberto Michelotti, “I - Stand” by Roberto Auciello, and “GreenCity” by Paolo Reato. The exhibition concludes with a section dedicated to the work of the 3 finalists of the “Shop Ability” competition for young designer sponsored by CEAN, a service company that specialises in the design and development of supermarkets and shops. “We design an accessible shopping container” was the title of the competition, and the aim was to find new solutions to eliminate the barriers that prevent the disabled from moving easily around a supermarket and shopping autonomously, making it possible for them to reach the products on display, wherever they are located. Pininfarina Extra and Cean will reward the best project by young designers, architects, engineers and professional people under 30 years of age. The first prize will be € 5,000, second prize € 2,000, and third prize € 1,000. The prizes will be presented on November 22 at the Cean headquarters in Trofarello (Turin) during the Open House “Innovation and Driven Design of the point of sale”, which is on the calendar of Torino World Design Capital events, and will be held in the premises on November 21-22. The public will also be able to express an opinion: all the visitors to the DesignAbility exhibition will be able to express their preferences through the E-Poll, the electronic voting booth for remote voting. The over 100 projects entered in “Shop Ability”, by young people all round the world, have been assessed by a jury of experts chaired by Paolo Pininfarina. The DesignAbility exhibition comes out on the occasion of the celebration of Torino as first world design capital. In fact, Icsid (International Council of Societies of Industrial Design), the world’s largest organisation dedicated to industrial design, has nominated Torino as the first “World Design Capital” for 2008, recognising that the city and the entire region of Piedmont have been successful in the profound process of transformation underway, which has involved combining the strong industrial tradition with the vocation for innovation and research. “With over 300 events in our Calendar – says Paola Zini, Director of the Organising Committee – Torino 2008 World Design Capital represents a great opportunity to develop the territory and give visibility to Italian design. It also provides a concrete chance to strike up and strengthen new national and international relationships. As World Design Capital, Torino is called on to represent the whole of Italy in the framework of the culture and tradition of design. DesignAbility is an initiative that goes in this direction, enhancing the way in which design could and should be used as a way to improve the quality of life for everyone”. ABLE TO ENJOY for the supply of the B-Free chair – This autonomous, innovative company was the brainchild of a young engineer and businessman, Danilo Ragona, who is also in a wheelchair, and was able to reinterpret the needs of the disabled person from his own personal and professional experience. CEAN for the organisation of the Shop Ability competition – CEAN is a company that specialises in the design and development of shops and supermarkets, which has been working for many years in the field of modern distribution, following its clients in all the stages that precede and follow the opening of a sales outlet. MONDO for tactile itinerary of the exhibition – Mondo was founded in 1948, and now has thirty manufacturing and marketing subsidiaries all over Europe and North America, and it specialises in the production of top quality sports, commercial and industrial flooring. TURIN POLYTECHNIC - DISET for the exhibition layout and catalogue – The Department of Building and Territorial Systems Engineering of Turin Polytechnic organises a post-graduate course in Universal Design, created with the goal of analysing the issue of the elimination of architectural barriers to improve access to public and private premises for disabled people. SARATOGA for the supply of the Smily dentist’s simulation unit – For over 30 years Saratoga S.p.A. has been the benchmark in the dental field, one of the leading Italian companies in the design and manufacture of metal equipment and furnishings for dental surgeries, clinics, and laboratories. TACTILE VISION ONLUS for the tactile catalogue – Tactile Vision Onlus designs and develops solutions to ensure that anyone with poor sight can receive information that is clear and accessible to everyone, in all environments of their daily life. DesignAbility thanks: Pininfarina Extra, more than 20 years of creativity between luxury and everyday-use objects Pininfarina Extra, the Pininfarina Group Company specialised in product and interior design, was formed in 1986 to extend the Group's services, quality and skills to firms engaged in all business sectors except the automobile. The mission of Pininfarina Extra is to become a reliable and competent partner through the construction of long-term partnerships with firms wishing to use design as a strategic aspect of their corporate identity. Among its partners, Alenia Aeronautica, Jacuzzi, Lange, Lavazza, Gancia, Motorola, Primatist, Snaidero, 3M and other international leaders. Besides the Italian site of Cambiano (Turin), since 2006 it has been operating Pininfarina Extra USA in Fort Lauderdale, Florida. Recent projects in overseas countries include the Torino 2006 Olympic Torch; the Gancia-Pininfarina wine bottles; the Lear jet 60 designed for Aero Toy Store; the Jacuzzi Morphosis Ωmega Steam Shower; the Snaidero Kitchen “Venus”; the Uffix collection of office furnishings “Luna”; the Samsung LCD monitor “Black Secret”; the Keating Hotel by Pininfarina in San Diego (CA); the interior design of Torre México for Mexican firm GICSA®; interiors offered by Alenia Aeronautica as an option for the Sukhoi Superjet 100; the Motorola-Nextel mobile phone “i877”; the Bric’s line of soft travelling bags; the bottle of the men fragrance Guerlain Homme. Pininfarina Extra is a company controlled by Pininfarina S.p.A. (whose Chairman is Paolo Pininfarina), quoted at the Stock Exchange since 1986. Founded back in the 1930s, Pininfarina is now one of the leading suppliers of services to the motor industry, able to offer carmakers creative solutions based on its expertise and flexibility through every stage of Design, Product and process Engineering, and the Manufacture of niche vehicles, as a complete-cycle “turn-key” partner or a supplier of specific services. The company has more than 3,500 employees and premises in Italy, France, Germany, the United States, Sweden, Morocco and China. Customers include: Ferrari, Maserati, Alfa Romeo, Ford, Mitsubishi, Volvo, Peugeot-Citroen, Renault, Jaguar, Honda, Daewoo, Hyundai, AviChina, Brilliance, Chery and JAC. From the Cisitalia to the electric car, past and future on show in the Pininfarina Collection Thanks to DesignAbility, the Pininfarina Collection opens to the public for the first time: thirty cars that have made the company’s history, from the Cisitalia to the Giulietta Spider, the Sigma Grand Prix and the Ferrari P4/5. And an absolute novelty: the Pininfarina B0 (or B Zero) electric concept car, which is displayed in Italy for the first time, a few weeks after its international debut at the recent Paris International Motor Show. The car, which is the fruit of a joint venture between Pininfarina and the French company Bolloré, will be powered by the revolutionary LMP (Lithium Metal Polymer) electric batteries. The B0 was drawn and designed by Pininfarina, and will be marketed under the company’s trademark; it is a compact four-seater people-mover with automatic transmission. Mass production will take place in the Pininfarina plants in Italy. The Pininfarina Collection reflects the company’s evolution from the 1930s to the present, respecting both its own roots and the culture of the product and its quality. The starting point was the creation of a theme that could connect the events in the past as it protected them into the future, with the perspective typical of a company that is eminently innovative and creative. Today, more than twenty years on, the Pininfarina Collection includes about forty essential cars from the 1940s to the present, displayed on a rotation basis, in a space kept deliberately small to underline the quality of the items on show, rather than their quantity: it is not an exhibition seen as an "opera omnia", but a selection of historical cars, models that were unique or produced in small numbers, and research prototypes. Each car has a particular creative, technical, industrial and even sentimental significance. Some examples: the Cisitalia 202 Berlinetta of 1947, which marked the international recognition of company founder “Pinin” as a designer, and was the first car in the world to become a permanent part of a Modern Art Museum, the MoMA of New York; the Lancia Florida II of 1957, the founder’s personal car for almost ten years up to his death; the Alfa Romeo Giulietta spider of 1954, which, more than any other, represents the watershed between Pininfarina’s artisan past and its industrial present; the cars of the Ethos project, examples of how we can rethink the car of the future; the Ferrari P4/5 by Pininfarina, a one-off created specifically for American collector Jim Glickenhaus. At this moment, some of Pininfarina’s more representative concept cars and prototypes are on display at Torino Esposizioni as part of the DREAM exhibition: the Ferrari Modulo, Studio CNR, Ferrari Mythos, Honda Argento Vivo, Metrocubo, Citroen Osée, Nido, Maserati Birdcage 75th, and Sintesi. The Collection is therefore not a conventional static museum space. The rotation of the cars is not dictated only by the inevitable need to maintain the models and the desire to periodically update the message of the display; it is also a response to the constant requests received from all over the world to take part in cultural initiatives in the design field, and automotive design in particular. “We are stimulated and encouraged by our past in our day-by-day commitment to the technical and aesthetic progress of the car which remains today as youthful and as full of potential as it has ever been” (Lorenza Pininfarina, Deputy Chairman Pininfarina S.p.A.).